Crazy how quickly 2012 came to an end, but i’m grateful to still be alive and have all the amazing supporters on my blog, and for that I say thank you to each and everyone of you! I am still growing as a writer, and brainstorming on ways to keep you guys entertained on the blog. Some revamping will definitely take place. One of my New Years resolutions is also to make sure I update more frequently than I used to. The procrastination must come to an end from today onwards lol. My roots were getting a tad too dark, so I finally got my hair redyed. What do y’all think? Special thanks to topshop for allowing me to visit their showroom location in L.A. 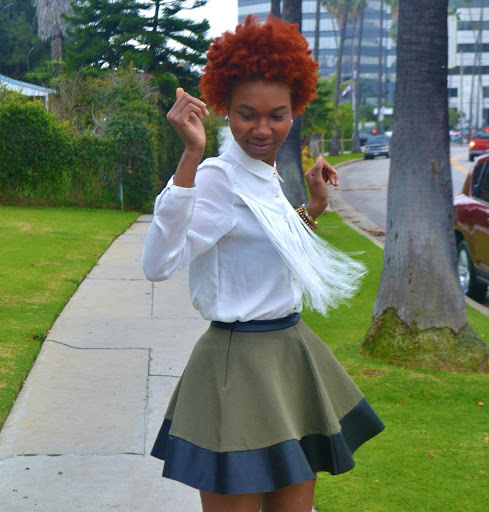 I got this khaki contrast hem skirt. 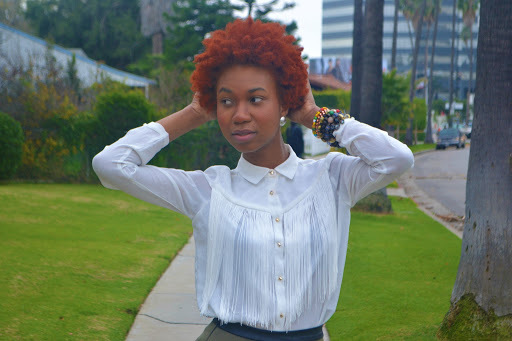 Paired it with my white fringe Zara blouse, that you may recognize from my champs elysees post. ZARA fringe blouse, TOPSHOP contrast hem skirt, FOREVER 21 leopard brogues (also worn here), FOREVER 21 earrings. Thanks a bunch Meda, glad you like the outfit! 🙂 My hair is copper. Besides deep moisturizing and oiling? I don't have a set styling method unfortunately. I tend to fiddle with my hair, loads of hair strand twirling and twisting(which is a bad habit that leaves your hair in knots lol). xoxo! !